We have had pictures allegedly showing iPhone 6’s front panel before and we have one again today. 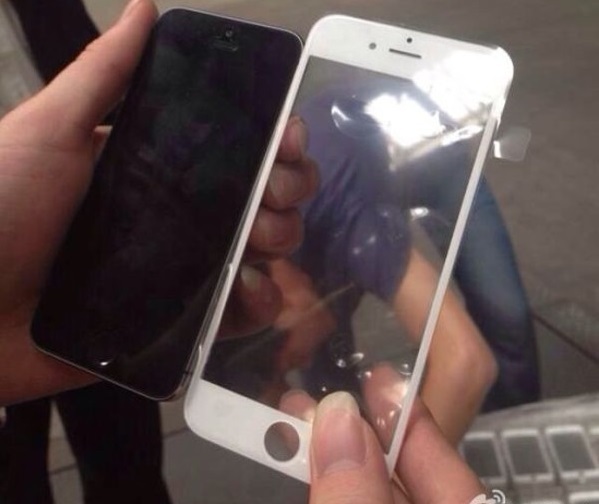 We have a new picture, which allegedly shows the front panel of the iPhone 6, comparing it alongside the iPhone 5s. The alleged front panel of the iPhone 6 is in line with the previous leaks and we are again looking at a 4.7-inch display panel. The leaks come out of one of the China factories, which have been notorious for these kind of leaks in the past. We recently came across a leaked screenshot from iOS 8 running on iPhone 6 and we have had several rumors and leaks pointing to a 4.7-inch display packing iPhone 6. We have had rumors of a bigger iPhone even before the iPhone 5s launched but this time things do seem concrete. Currently, all the rumors point to a iPhone 6 with a 4.7-inch display, powered by an Apple A8 chipset, an 8 MP camera with OIS and more improvements and iOS 8, which will bring a lot of health related features and improvements to Apple Maps. There’s also the rumored iPhone 6 phablet with a 5.5 or 5.7-inch display for later in the year. With Apple’s WWDC conference set for June, we should know more about iOS 8 and we hope Apple gives out some hints on the iPhone 6. As always, we’ll be here to let you know.